When you first start the search for apartments for rent, chances are that you’re thinking about how the stuff you already own will fit into your potential new space. That is an important thing to consider, to be sure! The good news is that at Summit Riverside, we have plenty of luxury apartments with different floor plans to choose from. We’re also proud to say that we’re one of the more pet-friendly apartment complexes in Littleton. Some of our pet amenities include many nearby parks and trails for your pups to enjoy and we also have a low pet rent, not to mention the fact that you’ll be surrounded by a community of pet lovers! So yes, your pet will fit in just fine, but how can you go about making your new apartment feel like home? Fortunately for you, we have a few tips and tricks for getting it just right in today’s blog. 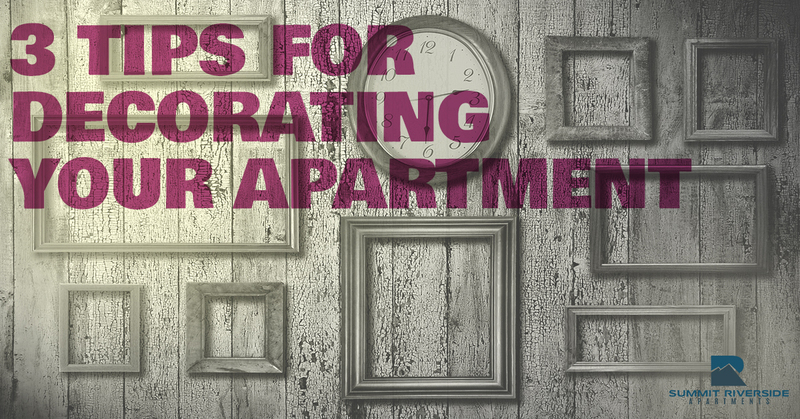 If you’d like to make your place the best apartment possible, keep reading for our suggestions! One of the absolute best things you can do for any space you’ll be living in is to introduce a bit of color. The units at Summit Riverside include stainless steel appliances, designer flooring, wood-burning fireplaces, track lights and updated light fixtures, and dark wood cabinets. That means that the canvas you’ll be working with in terms of color palette is already set up for your success! We believe that color can play a key role in making a space feel like your own. For example, if you’ll be using a spare bedroom as an office space, reds, yellows, and oranges are considered to be colors that can spur creativity and promote energy. On the other hand, blues and greens often have a calming and relaxing effect, making them perfect for bedrooms or living rooms where you plan to do plenty of lounging. A great way to bring color into your room is with blankets, throw pillows, rugs, and other small accents. Trust us when we say that a little bit can sometimes go a long way. Take a look online at home decorating sites, pick a few looks that you like, and figure out what makes you like them, then utilize their color palette to make your apartment feel great. Another great option for making your apartment feel homier is to bring in a few plants. We know what you’re thinking–“I don’t have a green thumb, so how is this supposed to work?” It’s a bit easier than you might think. There are a number of great options that don’t require you to be particularly attentive for them to still thrive. A bamboo plant will need to be topped off with water a couple of times a week, but they are very low maintenance. Head to a nearby home center and pop on over to their gardening section. You’ll be able to find succulents as well and there are many varieties to choose from. Succulents require very little water to thrive, so water them sparingly and infrequently and you’ll be all set. On the other hand, you could simply purchase fresh flowers to keep in a vase on your coffee table each week. If you prefer something as low maintenance as possible, there are a number of convincing fake flowers to choose from as well. Regardless of which option you choose, having a bit of nature inside can make all the difference in the world. Perhaps the best way to make your space feel like it truly belongs to you is to fill it with art that you love. There are plenty of options that will work well here and that is the beauty of it! Art can be found in local coffee shops, in online stores, and even from close friends. Maybe you have a friend who is an aspiring painter. Commision a piece from her! You might be interested in photography. Come up with a theme and take a handful of pictures, then have them printed and framed. Working on a budget? Frame a few drawings from your nephews, nieces, or young cousins and put them up around your apartment! At the end of the day, if it puts a smile on your face and you can decorate your home with it, it’s art. Get a little creative or do a bit of digging and you’re sure to find that there are plenty of great options to make your space a little bit more visually interesting and thus more appealing for you as its occupant. We know that there are a number of apartments for rent, but when you choose Summit Riverside, you can rest assured that you’ll be welcomed into a great space that is also close to bike trails, our 24-hour fitness center, a full-sized basketball court, playground, and an outdoor heated saltwater pool. If that sounds up your alley, you’re sure to fit right in! Regardless of what you’re looking for in an apartment, you will absolutely love the community here in Littleton. We’re close to plenty of great restaurants, coffee shops, and breweries. It’s hard to beat living in Colorado and this is particularly true with Summit Riverside Apartments in Littleton. Schedule a tour today and see for yourself!